Men who lack dignity, trapped in the heat-baked wilds of the outback, stranded by financial ruin, taking their aggressions out on a hapless kangaroo. 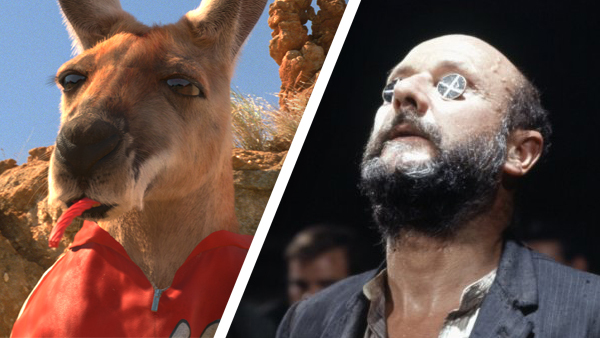 Yeah, that describes the god awful comedy "Kangaroo Jack," but it also describes Ted Kotcheff's harrowing classic "Wake in Fright," a film that was nearly lost to history but recently rediscovered in the unlikeliest of places. Film critics William Bibbiani and Witney Seibold pit one of the worst movies ever made against one of the best movies ever made, every week on THE TWO-SHOT, and this week's films might be the craziest they've ever done (yes, even crazier than "Jingle All The Way" and "Bicycle Thieves"). Head on over to the Critically Acclaimed/Canceled Too Soon Facebook page to suggest topics for future episodes, follow us on Twitter at @CriticAcclaim to vote in our weekly polls and force Bibbs and Witney watch the bad movies YOU want them to watch! The Six-Shot: All the 'Bring It On' Movies!